Reebok ZR9 Cross Trainer Review - The Perfect Home Workout? Reebok, a leading company in sports, offers an affordable, sleek cross trainer that delivers an intense workout thanks to 32 levels of magnetic resistance, 19 built-in programmes and monitoring. 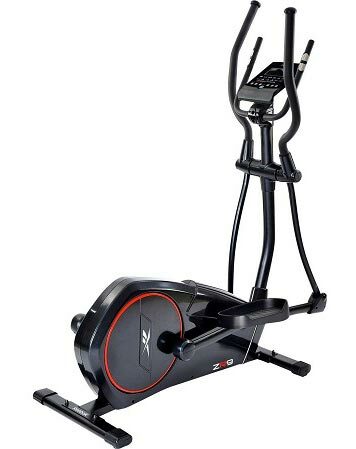 Let’s take a look at what this top rated cross trainer has to offer. Self-assembly is needed, and I’ll talk about this more in-depth below. When choosing the ZR9, you’ll find that this model is perfect for home use. The weight of 48kg may seem intimidating, but the transport wheels make it easy to move this cross trainer from one room to another. When you receive your unit, you’ll find that it doesn’t come assembled – this is the norm. Home elliptical machines always need to be assembled. But the good news is that the unit comes mostly assembled from the start. If you can put together a piece of furniture from the store, you’ll have this unit assembled quickly. And since you’re not picking up the entire 48kg at once, you’ll be able to assemble the unit solo. Some users recommend having an extra person to help you move the boxed model into the right room. I recommend wheeling the unit, using the transport wheels, into the appropriate room. The instructions are easy-to-follow, but some users complained that they weren’t in-depth enough for their liking. I didn’t find this to be the case. I suggest allotting up to an hour-and-a-half of time to be able to assemble your ZR9. Diagrams are included as well as an explanation of all of the included parts. A lot of users will be able to setup their unit faster than this, but this is ample time even when the instructions give you a problem. Note: The unit is mains powered, so when you’re in the middle of the setup process, make sure that you’re close to an electrical output. The footplates are adjustable, so make sure you adjust them prior to going into your first session. Proper adjustments will keep your feet in place so that you can enjoy a session with no slipping in the process. Handles. There are static and moving handles. I recommend starting on the static handles before progressing to the moving handles to get accustomed to your cross trainer. Now that you know how to properly setup your unit and adjust the footplates, you’re ready to go on to your first session. Sturdy and durable, you’ll notice that all of the parts are enclosed, allowing for protection against dust and injuries. The unit has a beautiful trim, and aesthetically, it looks and feels like a high-end cross trainer. 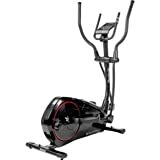 Using the static or movable arms, the unit doesn’t squeak or rattle like many budget cross trainers do. You won’t be able to rock the unit back-and-forth. I like this because it makes me feel more confident when I am trying to reach my peak heartrate. If you would like to see some great cross trainer workout ideas from the Gym Professor then simply Click Here. Pulse grips are on the handles, too. While this is efficient and effective, it does provide a little concern about accuracy. Most experts agree that a chest strap will provide much higher pulse rate accuracy than a grip pulse. But for the price, it’s hard to beat. The flywheel is also 9kg, which does two things: allows for fluid motion and keeps noise production to a minimum. Taller users will also be able to enjoy a 15-inch stride when exercising. A longer stride makes it far more comfortable for taller users to achieve full range of motion during their workouts. It’s a design feature that every taller user wishes they had when exercising on a smaller unit. Resistance can be controlled with a click of a button. You’ll be able to adjust between 32 levels of resistance. These resistance levels are meant to push your body to the limit. When you adjust between resistance levels, you’ll put more tension on your muscles. Time under tension is what results in muscle growth. Resistance also leads to increased caloric expenditure, helping you lose weight faster if that’s your goal. Resistance can be adjusted manually as part of the manual program, or you can choose one of the pre-programmes that will adjust resistance levels for you automatically. 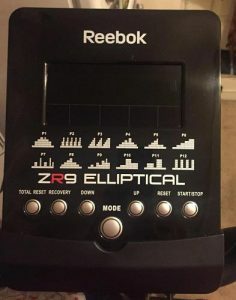 The display unit of Reebok’s ZR9 is a major success. 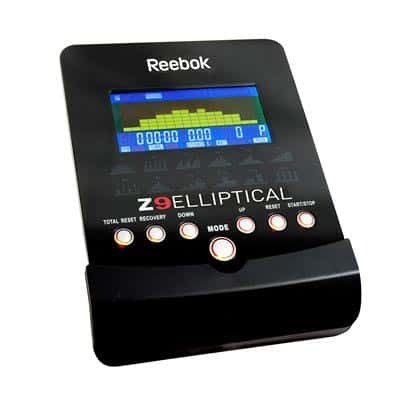 The LCD is bright and compact, allowing you to easily read the display during your workout. You’ll also find that the display comes with large buttons to adjust between all of your workouts and settings. You’ll also be able to view your resistance levels right on the screen. It’s a great display for new users because it offers all of the essential metrics without overloading the viewer in the process. Reebok’s ZR9 is affordable at about £300. Near-commercial-quality in construction, this cross trainer provides all of the essentials you need when looking for a cross trainer. And with the warranty that’s provided, it’s a great investment that can be expected to last for years without any hiccups along the way. You receive a 2-year manufacturer’s guarantee on your product. If your unit breaks or is defective, the manufacturer will make sure it’s repaired properly. This is especially important when you purchase a new unit that will show signs of defects during the first few months of usage. Assembly is easy for some users and a challenge for others. Take your time. Don’t get too overwhelmed by the diagrams, and you’ll assemble your unit rather quickly. Aside from this, the pulse sensors need a firm grip if you want to have an accurate pulse reading. But the pulse sensor is always an issue with hand grips. 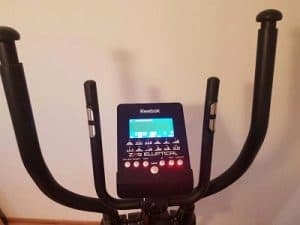 Reebok has, otherwise, created one of the industry’s top cross trainers at a price that is more than affordable for the casual or advanced user. Built-to-last, you’ll immediately notice that the unit has great stability, operates smoothly and offers advanced monitoring. Add in the resistance levels and programmes, and you have a cross trainer that will help you lose weight, enhance stamina and boost your overall fitness level. If you like the sound of the ZR9 then it is definitely worth seeing our review of the ZR8 as they are very similar. Click Here to see our Reebok ZR8 cross trainer review.